Ages 2-12 Scholarships are available. The Internet has opened an entirely new world for learning. 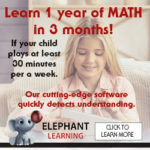 Elephant Learning is one of the latest developments using the Internet to bring high-quality math education into your home! Elephant Learning begins with the Dashboard, where parents can navigate through the program, track their child’s progress and compare it to the broad average of children that age. The software provides a clear & detailed picture of how your child is doing and provides activities to play with your child outside of the system to foster further growth. The lessons consist of computer-based activities that your child plays and advances through with the system automatically adjusting both up and down to meet your child at their level. Depending on age, children may start within an assessment to determine an initial starting point. The curriculum uses gamification to provide experience based learning. To start, a child may choose a character, for example a child may choose the Ladybug’s game which themes the curriculum in a beautifully drawn insect world. The narrator says “Can you give me 14 ladybugs” and the child moves the correct number from the bottom of the screen up into the playing field. In another activity, the narrator says “I have 3 ladybugs; I need a total of 4. Can you tell me how many more ladybugs I need?” The child then clicks on the correct number from a column on the right. These activities are repeated from smaller numbers to larger numbers, helping provide intuition into inductive thinking. The games personalize to the child by saying the child’s name and adapt to the level of ability of each child very quickly. The graphics are high-quality and attractive, making using the program enjoyable. The developers of Elephant Learning, Dr. Aditya Nagrath, mathematician, computer scientist, and entrepreneur and Dr. Alvaro Arias PhD, Professor of Mathematics at the University of Denver, are teaching concepts, not procedures. They state that the reason it is typically difficult to teach these concepts to 4- to 6-years-olds, is that the concepts are so fundamental it is difficult for adults to put them into words. Elephant Learning does just that by providing mathematical experiences, making it different from other math-teaching programs available. The program teaches subjects that range from counting to fractions, decimals and percentages by incrementally increasing the difficulty of problems. To the layman’s eyes the questions may look very similar, but at closer look, what seems like repetition is ever so slightly harder. For example, a child may first produce 5 objects within a grid, and then be asked to produce 5 objects without the objects conforming to the grid. The games adapt, and your child is taken to ever more difficult concepts incrementally at an astounding pace.